Airwolf 3D is committed to manufacturing high-performance 3D printers that are fast, affordable, durable and easy to use. 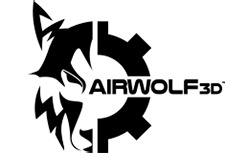 Airwolf 3D printers can be found in engineering firms, government agencies and schools worldwide. We are a manufacturer of additive manufacturing equipment and supplies. We design 3d printers, filaments, adhesives and additive manufacturing software. Airwolf 3D's patented technologies are supplied to a wide range of industries including industrial, automotive, education medical, dental, and others. Airwolf 3D's manufacturing processes include: molding, machining, laser cutting, fabrication, additive manufacturing and extrusion.